Halloween Week is always busy because both my Mother and Mother-in-Law have their birthdays a day apart. That means two cakes, a trip to Guelph to deliver my Mom’s and of course Maple fudge for Halloween trick or treaters. 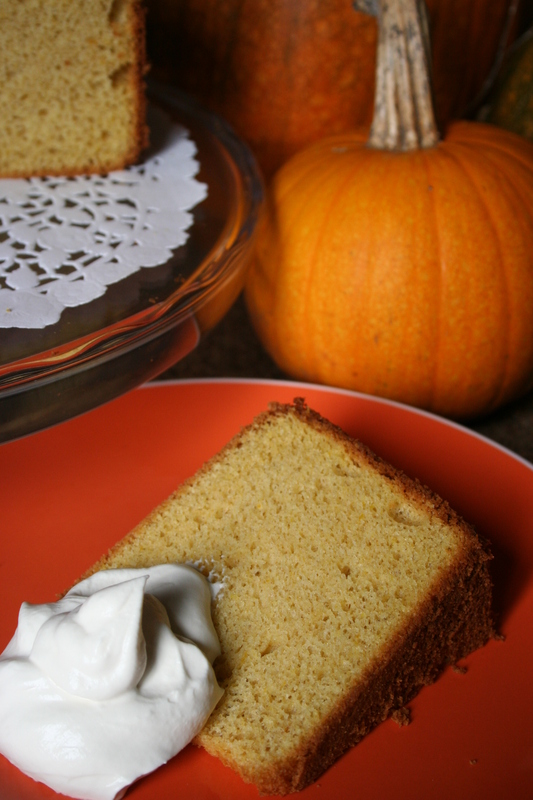 I was excited to share a blog on Maple fudge for the bazaar and Christmas giving season but it will have to wait because when I made the gluten-free version of the Pumpkin Chiffon Cake for Mom I just could not wait to show you how gorgeous it was! I wish I could give you a piece so you could taste it too! This recipe came from Wilma Chisholm and I cannot say I have seen it anywhere else in print. This was one of Mom’s favourite cakes and without the need for a sugary icing she was able to indulge in a small piece for her birthday even after she developed diabetes. As the photos show she can still count it as a favourite when it is made with a simple substitution of my gluten-free all purpose flour. Whip egg whites with cream of tartar in a clean bowl with clean beaters on high until foamy then slowly add 3/4 cup sugar while beating until stiff peaks form. In another bowl beat egg yolks, remaining 3/4 cup sugar and water about 5 minutes until yolk mixture is thick, pale and beaters leave marks. Fold pumpkin and oil into egg yolk mixture. Sift flour, xanthan gum and baking powder and stir into yolk mixture until smooth. Pour egg yolk mixture over the beaten egg whites and fold together quickly but thoroughly. 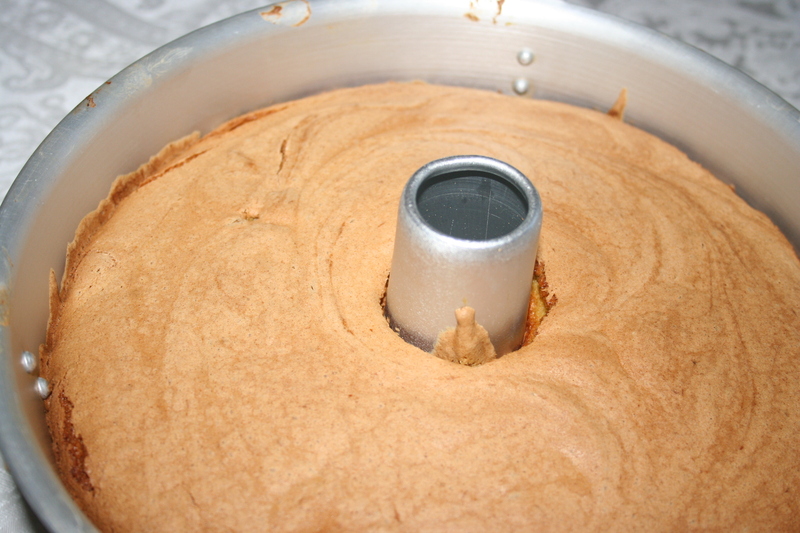 Immediately pour into an ungreased tube pan and bake at 350°F for about an hour until cake springs back when lightly touched and is golden brown. If cake is getting too brown before it is completely cooked then turn oven down to 325°F for remaining time. Invert pan on rack and cool completely. Serve with brandied cream on the side. Brandied Cream: I’m sure you will find somewhere to use any of this left over.